It was not a good evening to fly. 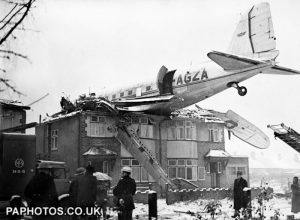 December 19, 1946, was a cold, snowy evening at Northolt Airport, London, when Railway Air Service’s G‑AGZA, c/n 12455, DC‑3 service to Glasgow Airport on behalf of Scottish Airways, taxied into position for take-off. It had a total of four crew and one passenger on board. 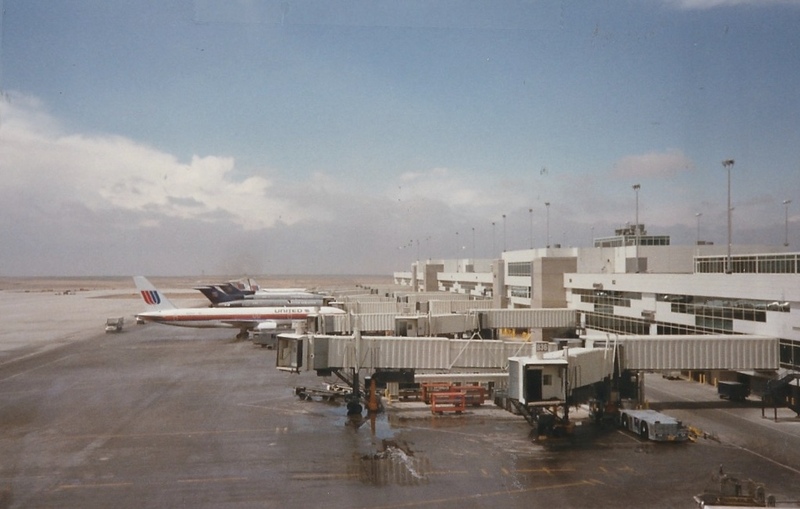 The snow storm had closed the airport to incoming traffic, and outbound traffic was subject to long delays. The plane had been waiting for more than an hour for clearance. The aircraft had been de-iced since it was a cold, snowy evening which had delayed the departure. While the Dakota was waiting the temperature dropped and snow began falling which froze on the wings. 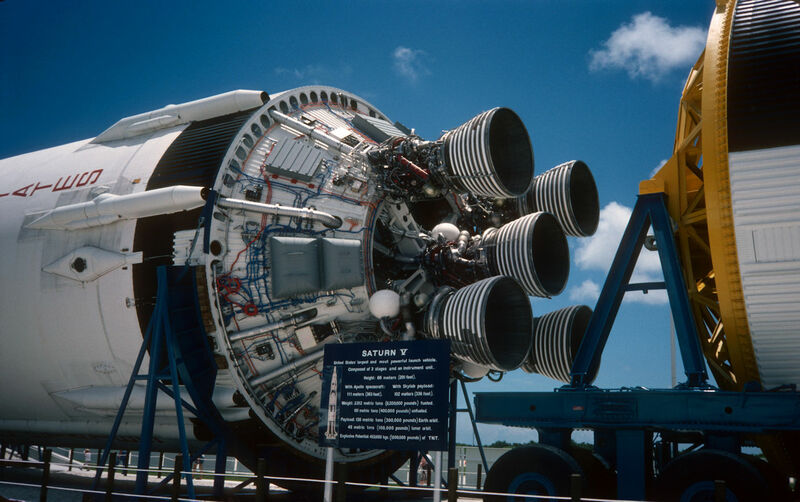 When G‑AGZA received clearance, the pilot ran the engines up to 45.5 inches of manifold pressure and 2,500 RPM. Time to go! He released the brakes and the airplane lumbered down the runway, but the old warhorse did not want to make the trip. As the plane gathered speed air rushed over its wings, but the tail did not rise. Both pilots looked at each other, and at the instruments. Then, the tail began its slow, lethargic rise. The pilots relaxed. For a moment, they thought there was a problem. The old Gooney Bird was having trouble getting off the ground. There was too much ice on her wings. She should not be flying but the pilot didn’t listen to her subtle signals. Eighty‑four knots and the pilot pulled back gently on the yoke. The Gooney Bird struggled to get off the ground, its Pratt & Whitney engines clawing at the air. She could remember this happening before, but in a war, when she was RAF Dakota KG240. Although struggling, she would fly again, even though the laws of aerodynamics said it was impossible. Her wheels left the icy runway and she could feel them tucking away inside her. That helped a little, but not enough. 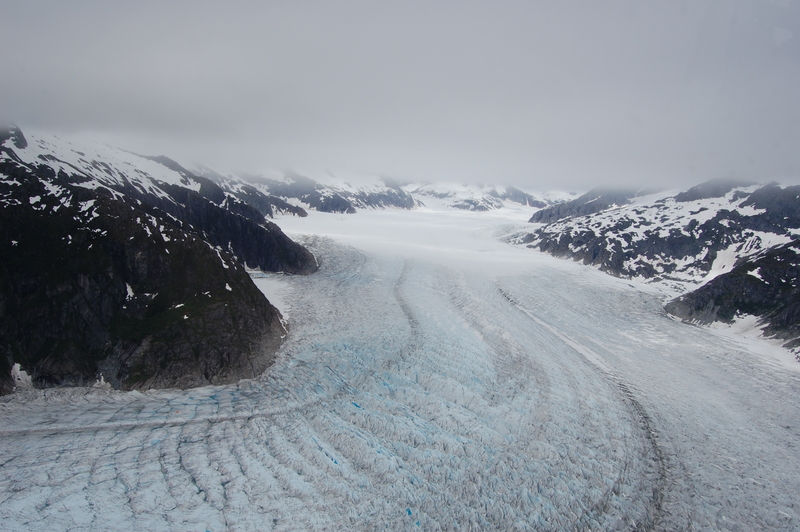 Her propellers were biting at the air, hardly giving her 50 feet of altitude. She was just barely flying. Suddenly there were houses in front of her and more ice on her wings. Her nose came up a little, but it was too late. The ice on the wings disturbed the air flow, which resulted in the aircraft not gaining any lift. 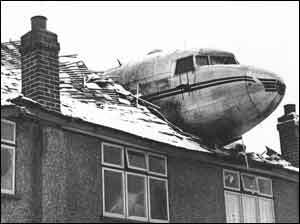 It was however too late to abort take-off so the crew was forced to try to get the aircraft to climb. She hit the roof of the first house with a sickening, scraping noise, but her forward motion continued. She tore the roofs from three more houses before coming to rest. Metal and wood groaned under her weight. Then, there was silence. People came rushing out of their homes. In the distance a baby was crying. The Gooney Bird had nested on top of the last house. 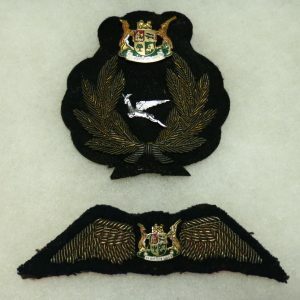 Its wing tips were missing but the nose and tail remained undamaged. There were no injuries on the ground, only a frightened baby in its crib, looking up through tear‑filled eyes, at the belly of the plane. The four crew members and one passenger walked away from the plane, but instead of in Scotland, their destination, just minutes away from their point of departure. The Dakota involved made its first flight in 1944 as Douglas C-47A 42-92633 military transport of the United States Army Air Force (USAAF) and had Douglas serial number 12455. 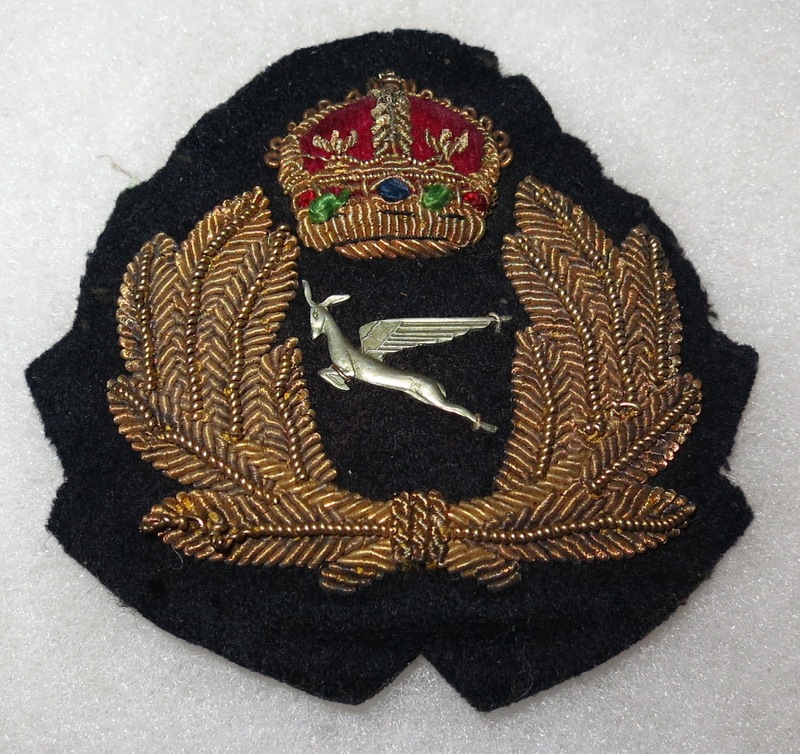 It was transferred to the Royal Air Force (RAF) as KG420. 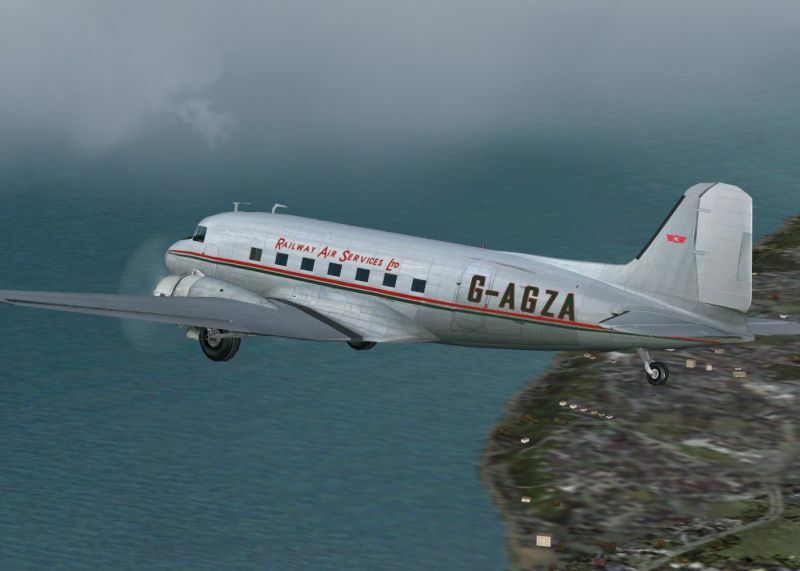 KG420 was registered to Railway Air Services as a Dakota III in March 1946, with the British registration G-AGZA, powered by two Pratt & Whitney R-1830-92 Twin Wasp engines. 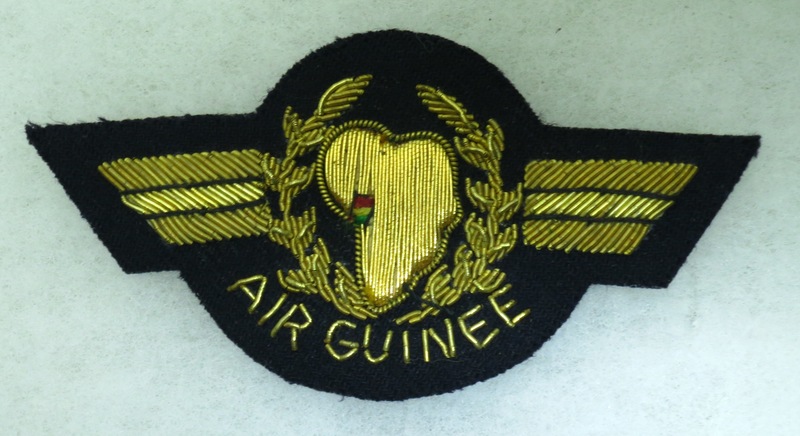 I have several more air carriers from the African continent, which I had not featured before, as well as a recently acquired metal cap badge of Royal Air Maroc. 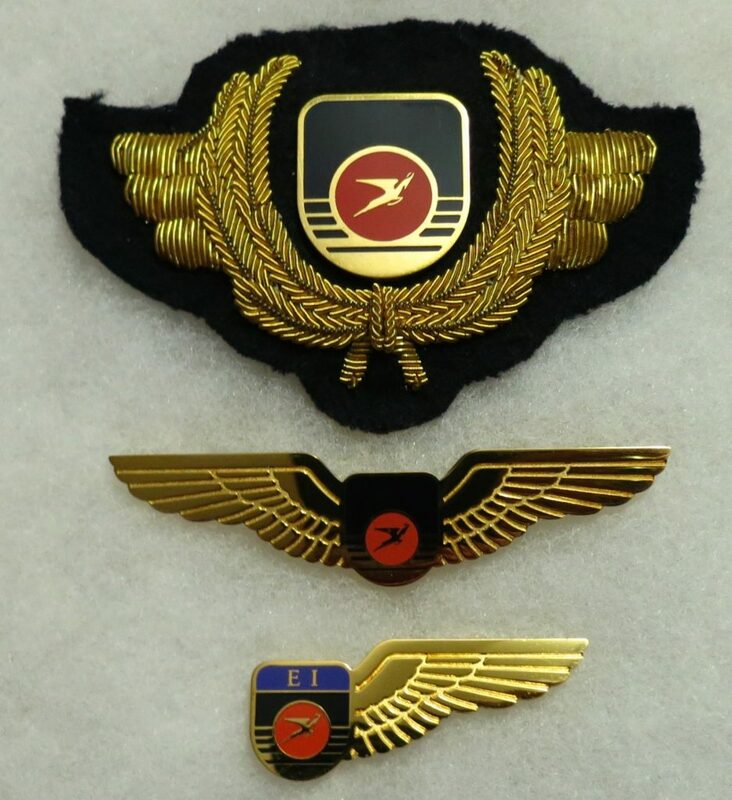 In many cases, I have either the wing or hat badge of the airline rather than a full set of insignia. 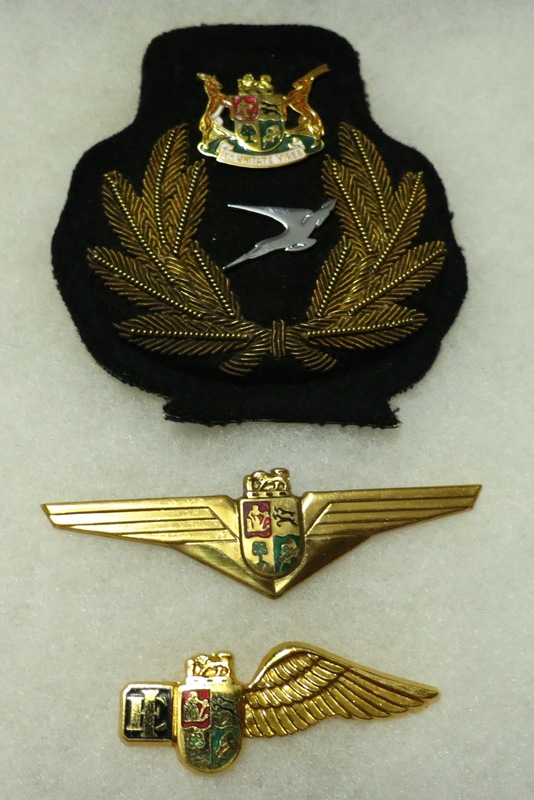 In the case of South African Airlines, several different sets of insignia were issued over the course of many years and represent eras during and after the country’s membership in the British Commonwealth. 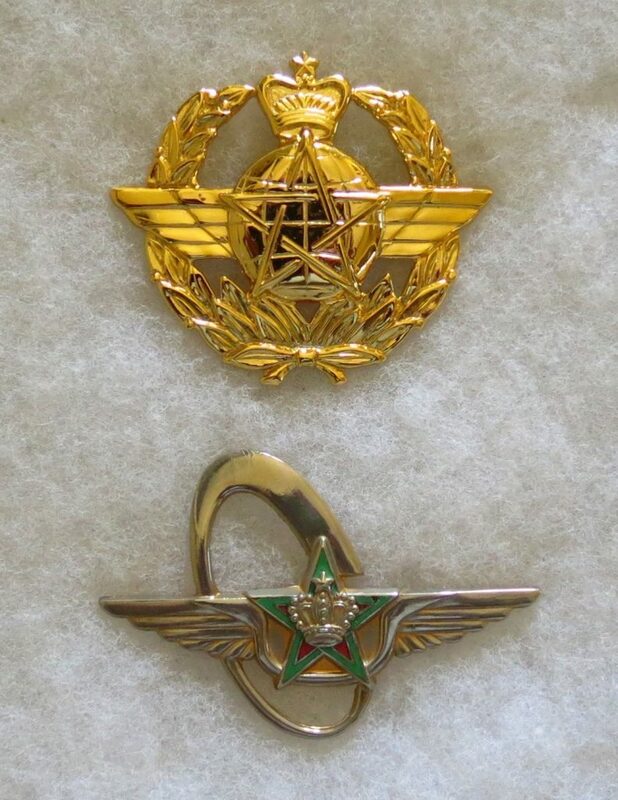 Several of the SAA variants include the insignia worn by engineer staff. The dates which I have indicated are approximations, if anyone has more accurate information, please share with me. 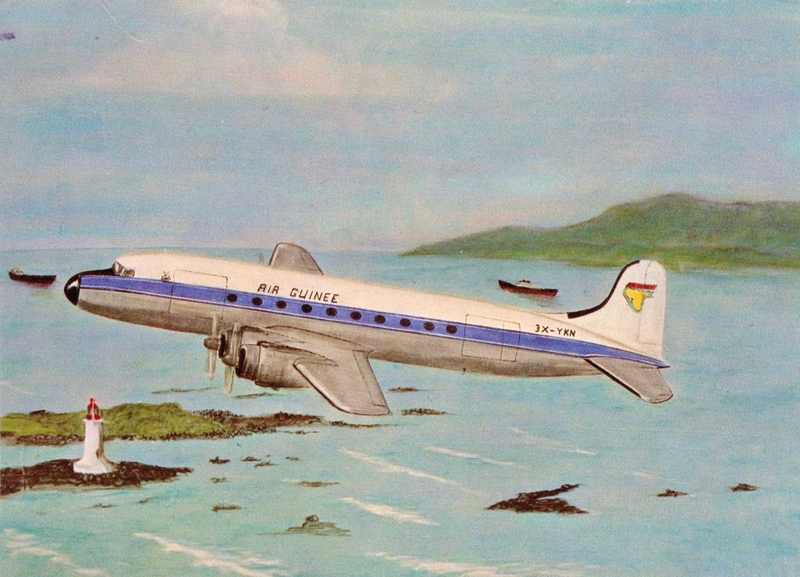 To get a ride on the last scheduled DC-3 airline service on planet Earth, you must travel to Yellowknife Airport, located at 62 degrees, 26 minutes, 32 seconds North by 114 degrees, 23 minutes, 51 seconds West. That will put you just 318 miles south of the Arctic Circle. The DC-3s are operated by locally-based Buffalo Airways which also operates other scheduled passenger, charter passenger, charter Cargo, fire-fighting and fuel services. Buffalo Airways’ main base is at Yellowknife Airport (CYZF) with two other bases at Hay River Airport (CYHY) and Red Deer Regional Airport (CYQF) in the Canadian Northwest Territories. 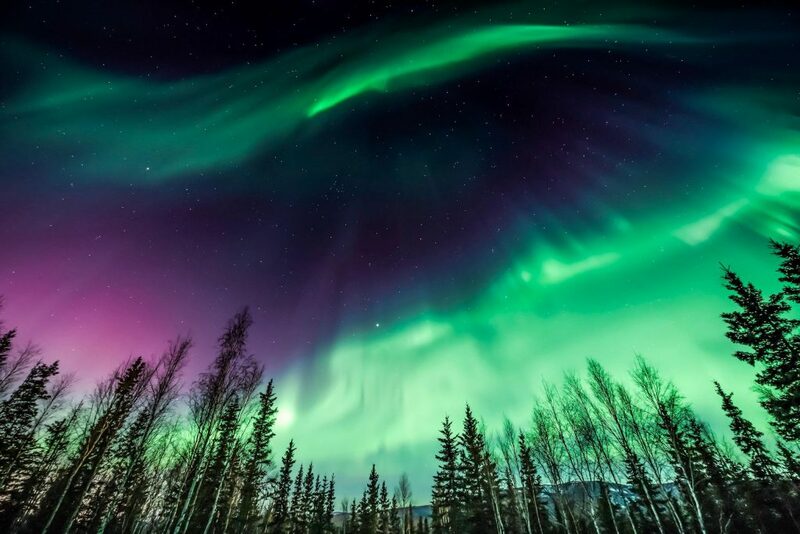 Yellowknife (the name comes from the hunting knives forged from the naturally occurring copper used by the local Dene people), is the only city and the capital of the Northwest Territories and has a population of approximately 19,000. The second largest town in the Northwest Territories is Hay River, With a population of approximately 3,600. The total population of the Northwest Territories is about 45,000 in an area that is double the size of the state of Texas. The challenge in this land is getting around the Canadian north, which can often be a hit-and-miss affair, especially in winter, The emptiness of this vast, featureless land, coupled with unpredictable and often ferocious weather conditions that have swallowed pilots, passengers and their aircraft whole, never to be seen or heard from again, is always a worrisome factor. One pilot disappeared on a routine winter flight in 1964. His remains and those of his passengers were only discovered in 2003, almost 40 years later. Traveling at 170 miles per hour, Buffalo Airways’ DC-3s can haul 7,000 pounds of freight or 28 passengers to destinations throughout the Canadian North. About one half of its passengers are repeat customers. Buffalo Airways has been operating its legendary DC-3 aircraft with their trademark green livery since 1970. 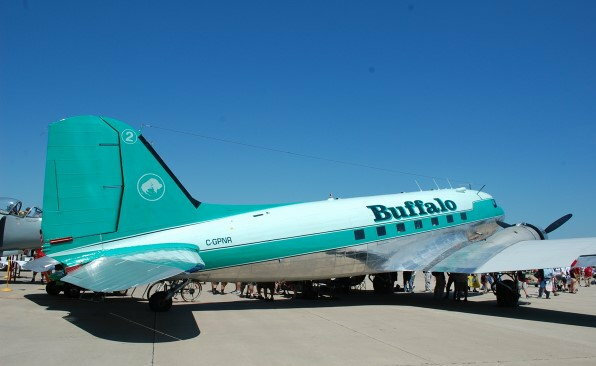 Most of Buffalo Airways’ warbird airliners date back to WWII and include 13 DC-3s, a couple of DC-4s, and Curtiss C-46s, two Lockheed Electras (the company’s only two turboprops,) and two Canadair CL—25 fire bombers. Today it is the only airline in the world to fly, a seven day a week, scheduled DC-3 services between Yellowknife and the Hay River Airports. The flight takes approximately 45 minutes. According to Mickey McBryan, the current general manager and son of the legendary Buffalo Joe McBryan, the founder, and current president of Buffalo Airways, the name came from one of Joe’s first flying jobs, counting buffalo. Mickey says his father made the first flight to Hay River around 1970 and has since made the flight over 7,500 times. Buffalo Airways has been the subject of the popular Canadian reality television series, Ice Pilots NWT a 13-episode real life documentary series about an unorthodox airline in the Canadian North. Yellowknife-based Buffalo Airways flies WWII-era propeller ‘planes — big old aircraft built by “Rosie the Riveter” that have remained virtually unchanged over the years. Rookie pilots defy bone-chilling temperatures to fly cargo and passengers through blizzards, breakdowns, and transatlantic journeys. It is an impossible job in a merciless place. Every pilot starts at the bottom — as a “rampie.” They work the ramp in minus 10 degrees Celsius, and if they have what it takes, they will eventually sit in the right seat of a DC-3, and sometime in the future they will move to the left seat. The climate demands courage, character and mental toughness. The pilots of Buffalo Airways have those traits, if they don’t, they leave. Mc Bryan says they have about a 95 percent pilot turnover rate. The real meat and potatoes of the Buffalo Airways business is the freight. Three DC-3s are reserved for passenger service, and the others for freight. 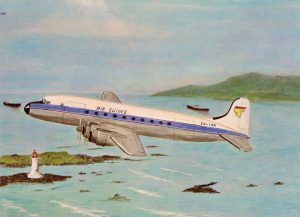 Depending on the load, they may use a DC-3 or a DC-4. Grocery stores and other merchants depend on Buffalo Airways to get supplies to them all year long, and winter is the biggest challenge. Each spring, the mile-long ice bridge over the Mackenzie River breaks up and flows out to the Beauford Sea, severing the only “road” leading from southern Canada to Yellowknife. For more than four weeks, and another month each autumn, the city of Yellowknife remains cut off from the rest of the world. The only access to the city and its outlining settlements during those periods is by air and Buffalo Airways. 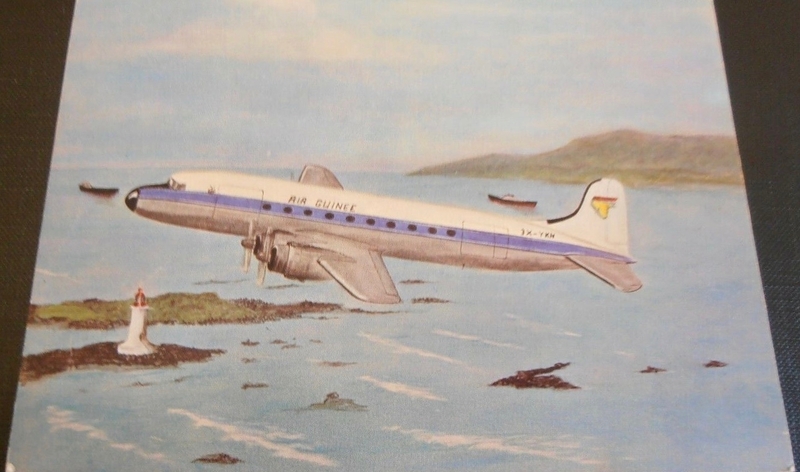 The pilots and passengers of Buffalo Airways may not think much about the fact that they are travelling in a virtual time machine .Its designers had no idea it would out last all of them, and it is still going 75 years later. The area does not have permanent roads, and the only way people can be resupplied in winter is by Buffalo Airways. At some point during the winter, Yellowknife is literally cut off from civilization. The pilots of Buffalo Airways’ job is to bring food, fuel, medicines and freight from civilization to remote, isolated settlements around the Arctic Circle. 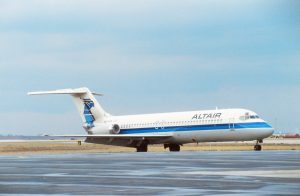 Altair Airlines was established as a commuter carrier based at Philadelphia airport and started operations on November 4, 1966. 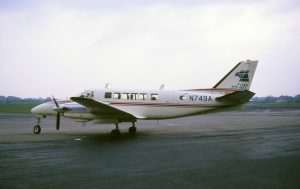 Early service connected Philadelphia with Scranton, Harrisburg, and Allentown using the nine-passenger Beech Queenair aircraft. The name Altair, was curious and was derived from the bright star “Altairus” located in the constellation “Aquila” or Eagle for which the airlines logo was created. 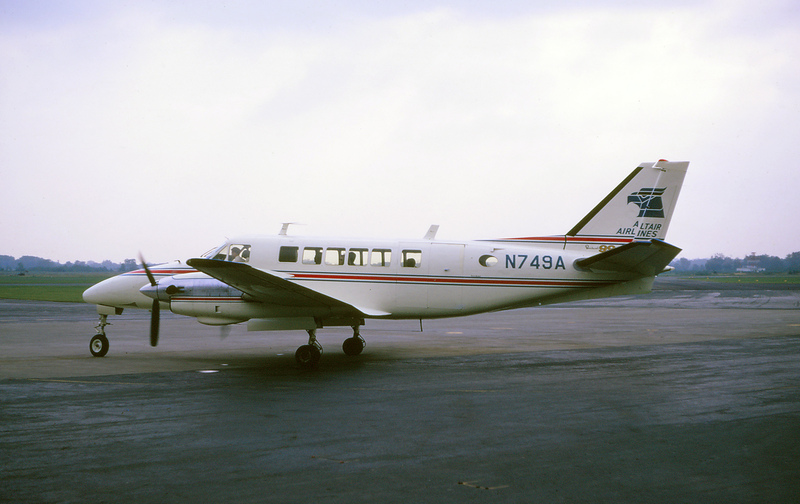 One of the Beech 99s caught departing the ramp for another regional flight in 1971. By 1970, Altair had expanded operations across to adjoining states, was serving twelve cities, and had acquired the Beech 99 turboprop. 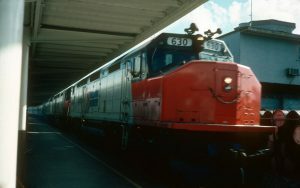 At times, facing competition from rival Allegheny Commuter in many of its markets, Altair was able to maintain profitability and service. With the watchful eye of the Civil Aeronautics Board (CAB), a new 32-seat limit was placed on commuter aircraft in 1972. 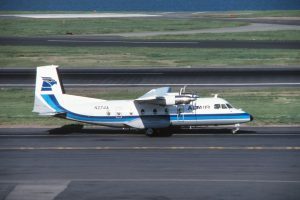 Altair, in an effort to increase loads, looked to the French designed Nord 262 turboprop, with a capacity of twenty-seven seats to meet the CAB recommendation. 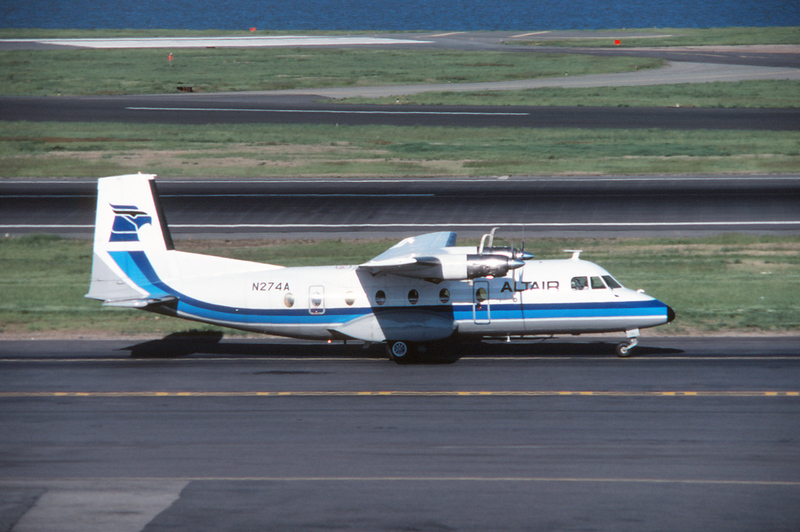 The French built Nord 262 served Altair through the late 1970s and is seen taxiing at Washington National Airport in 1981. The first Nord 262 was delivered in 1975 and was used with the Beech 99s to continue flying over 100,000 passengers yearly. On the heels of deregulation in 1978, many airlines realized an opportunity to enter new markets and Altair was no exception. 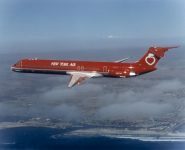 The airline placed an order for ten of the 74-seat Fokker F-28 jets with plans of route extension to Florida and the Eastern Seaboard. 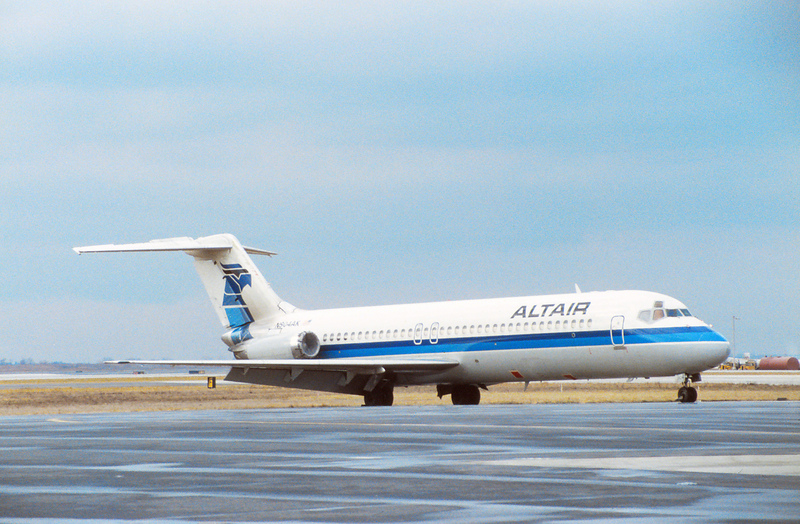 The Fokker F-28 allowed Altair to expand to further markets including Florida. Parked on the ramp at Tampa International Airport in 1982, is N504. The first F-28 “Starjet” service started on October 15, 1980 and routes expanded as far south as Tampa and Sarasota, Florida. After only a year in service and on the heels of the PATCO strike in 1981, Altair started to suffer financially. 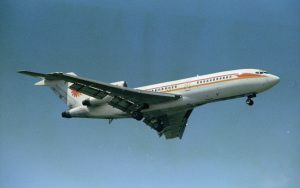 An attempt was made to establish a hub-and-spoke system from Philadelphia and Altair purchased three Douglas DC-9s from Air Canada for the service. 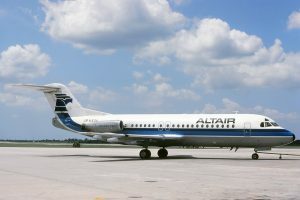 Although the airline had become “pure-jet” by mid-1981, continuing financial loses as well as fierce completion with both Piedmont and USAir at Philadelphia, forced the privately held Altair into a downward spiral. 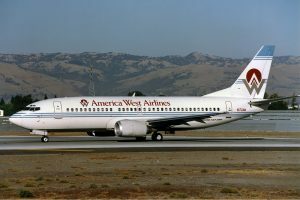 With over $34 million in losses, the airline filed for Chapter 11 bankruptcy protection on November 9, 1982 and suspended all operations. Still painted in the airlines colors, the Douglas DC-9 only saw service for a few months and is parked awaiting disposition at Philadelphia International Airport in early 1983. You might be wondering how I know the exact ship which was involved in jetting us to that charming British isle nearly 50 years ago. The answer comes in the form of a little tan package offered to my father on board the flight. Inside it was a small set of metal wings, a description of the Super VC-10 and, most important of all, a slim 4 X 6 inch hard cover booklet. It was Navy Blue with gold lettering on the cover which read “BOAC JUNIOR JET CLUB LOG BOOK.” My dad filled out our contact information on the inside of that cover under my name and handed it to the stewardess. 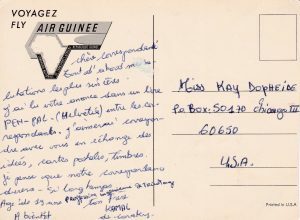 She then conveyed it to the “flight deck” (the VC-10 was far too regal an aircraft to describe that area as a “cockpit”) where the captain filled in a horizontal line of 6 small boxes describing details of the flight. In the 7th box he signed his name. 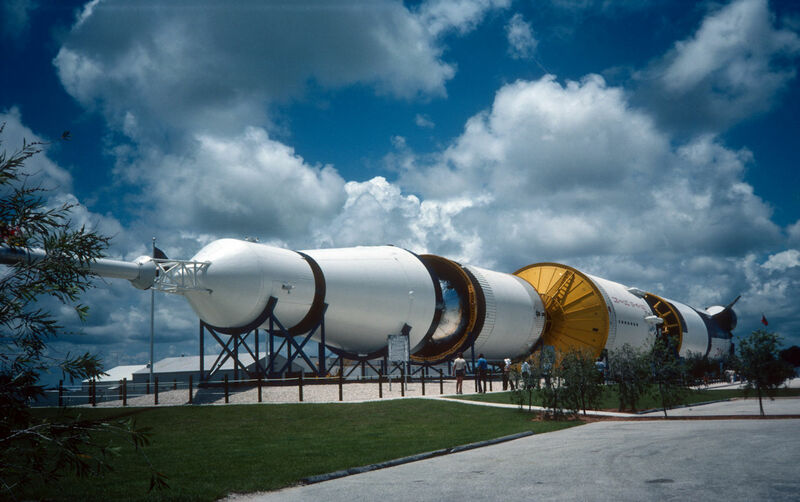 My father had no way of knowing it at the time, but by taking that package on an early summer day in 1968 he was launching his son’s lifelong love affair with commercial aviation. 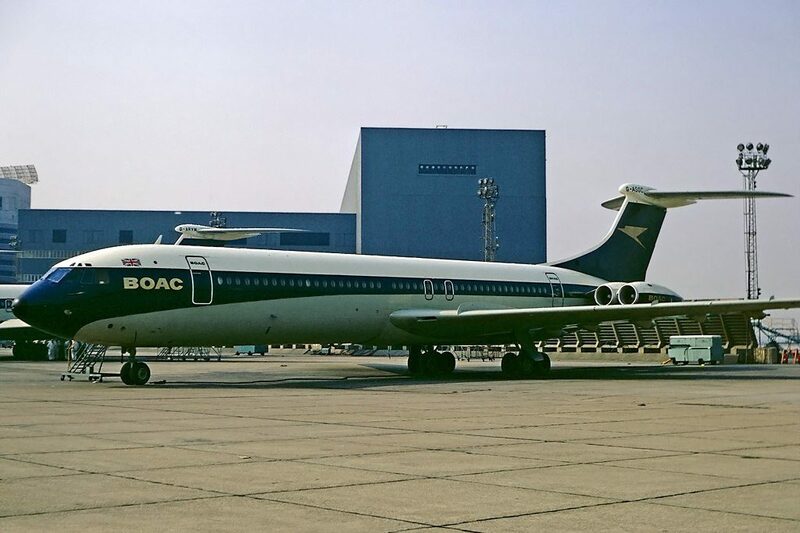 I went through four of those BOAC, and later British Airways, log books through age 16 and then shifted to a generic passenger log book when I felt I was no longer a “junior” anything. I still maintain one in fact. This means I have logged virtually every commercial flight I’ve been on in the past half-century. These books are probably my most cherished physical possessions. I don’t mind admitting that I keep them in a fireproof box at home. Today I am a trained aviation manager and the director of an aviation museum. I’m deeply involved in the airline/airliner enthusiast community as well. Commercial flight, and everything it encompasses, has become both a passion and a vocation for me. I literally thank God that my dad (who passed away in 2005) thought the Junior Jet Club might be something neat in which to involve his infant son. In my life since that day, at least as far as aviation goes, it has made all the difference. I think of my years of travel often, and with great enjoyment. It sobers me to realize that virtually every airplane I flew on during my business flying career has most probably been sent to the aircraft graveyard to be scrapped. Many great memories now in the recycle stream. I sat next to who? America West was a relatively new airline and when they started their frequent flyer program, so of course I joined. Just after I got my card, I had a business trip that took me to Phoenix and back. On the way back I was on the red-eye. Waiting in the gate area, they are calling for volunteers because they need the seats. Then they call my name. At the podium I was told I was being upgraded to First. I thanked them but asked why me since I don’t fly America West that much. They said I as the only one in Economy in their frequent flyer program so they would reward me. I boarded and was in the window seat in the last row of First. There was someone next to me, and during the flight the cabin staff were offering him drinks and amenities. Since I was an upgrade not a full fare First I thought little of it (plus at 11:00 I don’t want a lot). As we started to land, a few more cabin crew came by and asked for (and got) autographs. I have no idea who this gentleman was (my guess a singer that I did not know), but he certainly made an impression on the flight crew. I remember I did not want him to think I was ignoring him, so I just wished him a great day, and he said thank you and that was it. With my travel volume I got my share of normal upgrades to First where the famous almost always fly. And at the airport, celebrities are often given access to the Airline clubs. I saw Phyllis Diller in the Eastern Ionosphere club in Newark, and Cher in the United club in Newark. I am sure there were celebrities on the flights that I did not know who they were, but two I remember were Dr. Joyce Brothers who sat in the seat in front of me on one flight (and was both beautiful and very petite) and on another flight James Doohan sat diagonally across. My personal rule was never to bother anyone famous I saw, but after I landed in LA, Mr. Doohan was met by someone from “the studio” and had him wait for the car. I broke my rule and just thanked him for giving me and his fans such enjoyment as he played Scotty in Star Trek. He smiled and said Thank You. Today any meal on an airplane is something special (or at least unusual). Back in the day, both First and Economy got meals. 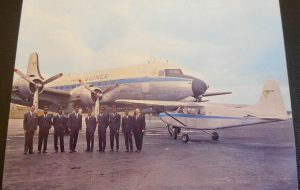 On transcontinental United flights that involved a hot breakfast about 40 minutes after takeoff, and a box lunch an hour before landing. The service carts were well designed with a heated plate that went under the hot meal dish on each tray. I found that no matter how they served eggs, they never survived well. A better bet was the pancakes rolled around apple pie filling. Unfortunately eggs were on 80% of the flights, pancakes or something else was 20%. My favorite snack of all times was on Eastern. They had a Disposable clear plastic tray and Saran wrapped an apple; a packet of cheddar cheese, packets of crackers, and a knife (plastic) and napkin. The apple was always crisp, and the amount of food was perfect for a mid-afternoon snack. And at the end of the meal, they did collect (and recycle) the plastic trays. When the airlines tried to save a little on flights like Newark to Florida they would give a box of cereal, a container of 2 milk and a banana to each passenger. That was better than a lot of the meals I am sure cost the airlines much more money. In the lucrative NYC-DCA market (where the one-hour flight could often cost $300) New York Air had a “flying Nosh” service where they promoted the service by giving you a fabric bag with a bagel, a packet of cream cheese, and a small container of jelly. The bags were great because you could keep them. My children used them as lunch bags for a while. The other thing about NY Air was they had MD-80s in their fleet. Entering the MD-80 through the main cabin door you could easily see and read (because the line moved slowly) the metal plate which gave the serial number of the aircraft, and the manufacture date. I recall most of those on which I flew were in the 1983 vintage. And they did compete with the Eastern Air-Shuttle of guaranteed seat fame. So they booked multiple plane loads on the same flight. And when you were at the gate area, they would call your flight and say if you have the grey boarding pass go to this gate, if you have the red boarding pass, go to this gate. This system worked very smoothly (at least every time I experienced it). In the 1990’s Denver had a massive building program to replace Stapleton Airport with DIA, Denver International Airport. If you travelled on United or Continental, you were often changing planes in Denver as it was a major hub. Stapleton was showing its age and there was (especially in the business traveling public) an excitement of a new and more passenger friendly terminal in a major hub. Like any program there was a lot of publicity and promised made and fact sheets about the new terminal left in the airline clubs and the gate areas. We saw artist conceptions and early photographs of the “circus tent” roof structures of the main terminal. Originally scheduled to open in the fall of 1993, there was delay after delay. We frequent travelers joked that DIA stood for “Done in August” but August came and went and we were still at Stapleton. 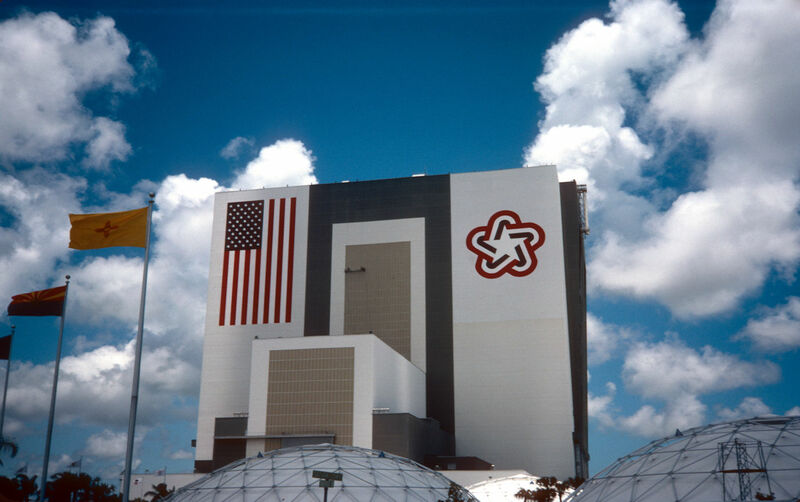 When it finally opened in February 1995, it was grand. 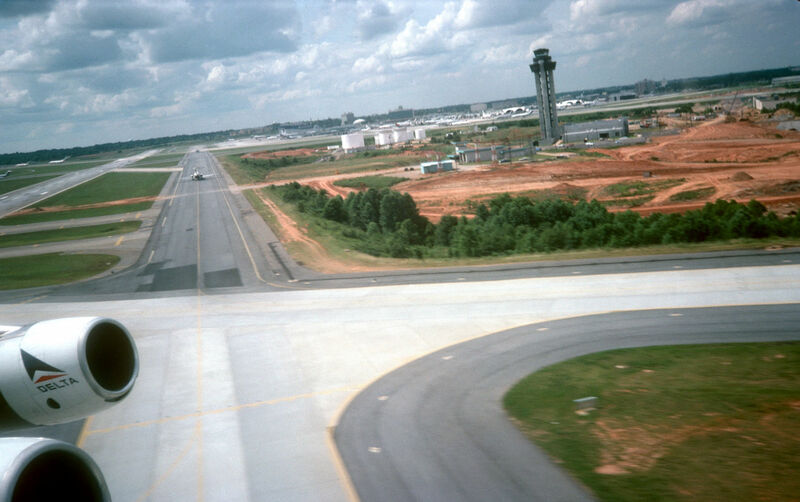 Because I controlled my own flights when traveling, my first trip after it opened, I scheduled a 3 ½ hour layover between flights and I went through the entire Airport. And I will say it was worth the wait. A PDF of the souvenir opening booklet is available at www.flydenver.com. If your search for it is not successful, google inside dia souvenir guide and it will link you to download the PDF. My first job after teaching was ideal for someone with a love for commercial aviation. My cubicle was right outside of the corporate travel office (and of course I made friends with the staff to the point where they showed me some of the workings of the Sabre reservation system), and I showed them (because we subscribed to the Lockheed database online services), the OAG online database. Both systems would give you flight data and seat availability for each fare class (I remember Sabre would tell you up to 7 seats available, and I recall OAG only told you if 4 were available. And of course you could search for the best fares. Corporate travel was run by a travel agency, and Phil (my key contact) told me that I could see virtually anything he could see on his Sabre terminal on my desktop computer and the OAG database. And he concluded that travel agents were dinosaurs. The key to getting any corporate travel department to like you was making their job easy. Go in with a set of flights have space on them and a fare basis that was close to the least expensive ones. Once you established you knew what you were talking about and you were able to prove it, I never had a problem with getting flights I wanted. 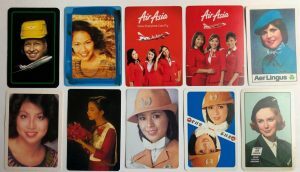 This gave me the ability to fly the airplanes I liked and the airlines I liked – or when feeling adventurous, flying new ones I had not experienced before. And I was successful in doing that in every company for which I worked thereafter. I only wish I had done as well in booking of hotels. I have one claim to fame (very minor to everyone else). While I was still teaching I worked part time for a computer programming company. 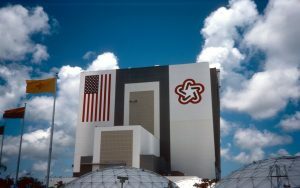 I programmed and consulted on the earliest microcomputers (Apple II, TRS-80, and Commodore Pet). This was about 3 years before IBM released the first PC. Boeing Computer Services (a computer division of Boeing Airplane Company) wanted to learn about these new microcomputers and what they could do (they typically worked with large mainframe computers). I got the assignment and gave a half day lecture/discussion of these new small computers. For weeks thereafter (and even to this day when I think of it) I float on air thinking that I had information that was of interest to the Boeing Company and they paid my employer to have me share it with them. I am not a pilot, nor am I an airplane mechanic. I never went to formal school to learn about airplanes. I read as many books and magazines about the airplanes I could find. But a lot of my best information comes from a source most people do not use. 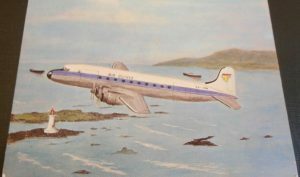 The Lockheed Constellation had its emergency life rafts stored in the wings, so in case of a water landing they would pop out. This was both fast and removed requirement of pushing rafts out doors or windows. The 727 has pitot tube sensors to gauge the airspeed of the aircraft on the tail assembly. 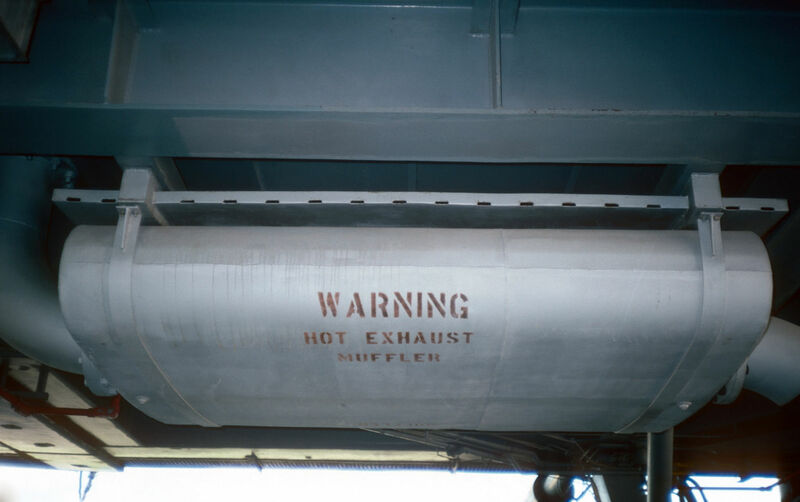 This information is used to control how much force is needed by the pilots on the cockpit flight controls for the tail surfaces. Facts like these as well as a wealth of information about how airplanes work (and sometimes don’t) area found in the US Government published Aircraft Accident Reports. In the 30’s it was the Department of Commerce. In the 40’s thru the 60’s it was the CAB (Civil Aeronautics Board), and now the NTSB. The government reports are not grim stories of crashes (as some books are), but are scientific, methodical studies of what happened and why and how to prevent it from ever happening again. 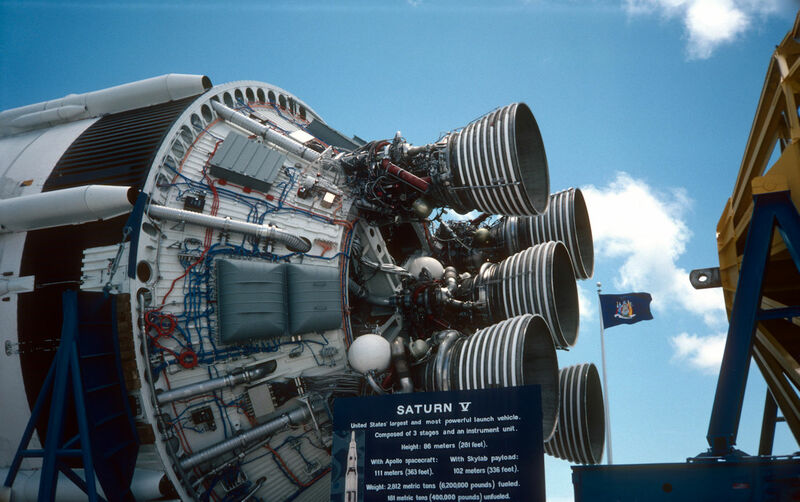 And they were a great educational resource on how airplanes were designed, assembled, and maintained. 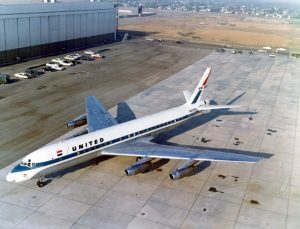 I started being interested when a United DC8 and TWA Constellation crashed over New York in 1960 (I was 13). I had lived on Staten Island not far from where the TWA crashed, and my great aunt lived in Brooklyn not far from where the United crashed. My parents (probably rightly) would not allow me to go and try to see the sites, but there were a lot of newspaper pictures. I was interested in how they could figure out what happened from this mess of wreckage. 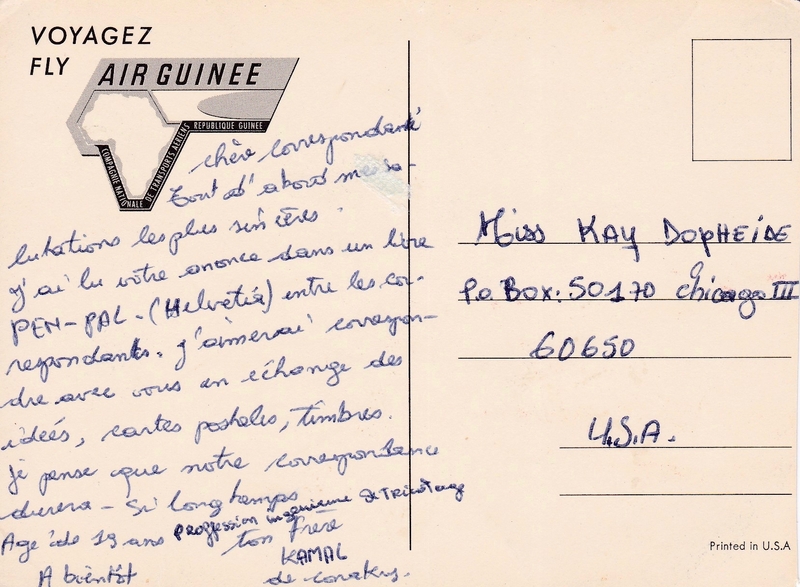 In those days you needed to write to the CAB and ask them to mail you a copy. And they did find and mail me about 275 of them over the years I was in high school and college. Now historic and current reports are available as PDFs online for download (most Wikipedia entries about a crash link to the AAR in the footnotes). The science of accident investigation has truly advanced in the 90 years of reports that I have read (my earliest was a 1936 crash of a Transcontinental and Western DC-2). They have gone from typed, mimeographed pages to PDFs that are almost books, many with color photos or illustrations where needed. And if anyone were to ever be concerned about flying being safe, todays’ reports confirm that many things must go wrong all at once for an accident to happen. I hope you enjoyed my flights down memory lane as much as I did. I am sort of out of things to say, but if Shea has any ideas on future articles to which I can make a positive contribution, you may hear from me again. 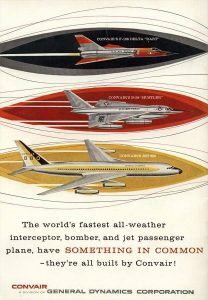 I first learned about the Convair 880 when I was in elementary school and read a library book titled The World’s Worst Aircraft written by James Gilbert. There are two other books with the same title written by Bill Yenne and Jim Winchester. 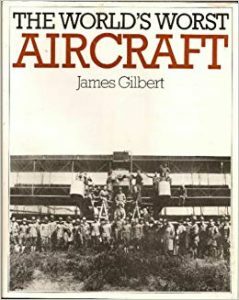 The Gilbert book has a chapter dedicated just about the Convair Jetliners. 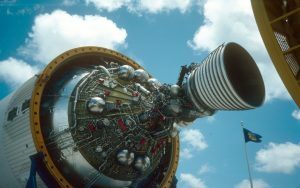 Mechanically and design wise the planes were very good but financially they were an utter failure for General Dynamics. 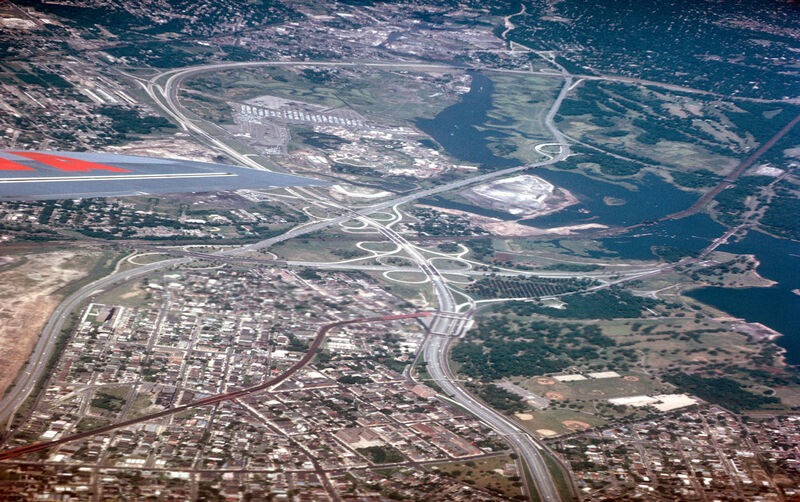 General Dynamics had purchased the Convair Corporation in March of 1953. 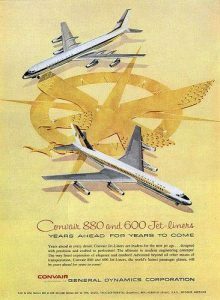 The Convair division began development of a medium-range commercial jet in April 1956 to compete with both the Boeing 707 and Douglas DC8. 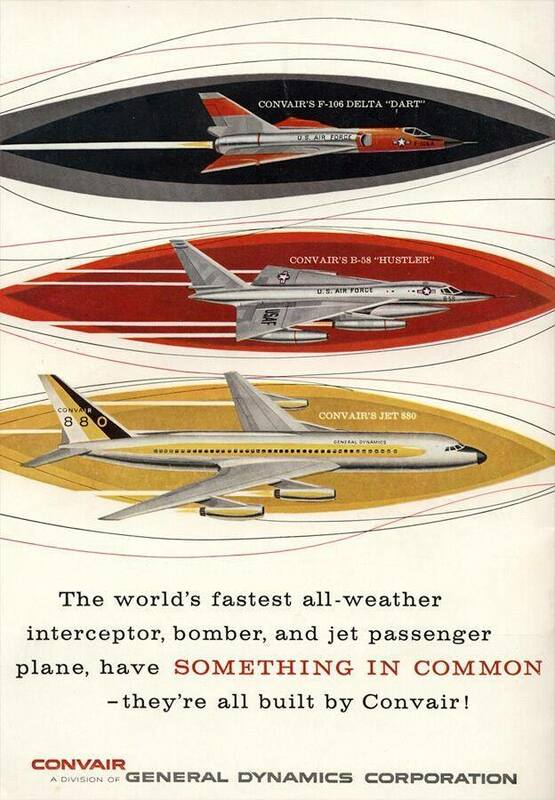 Initially the design was called the Skylark, then Convair 600 and finally the 880. 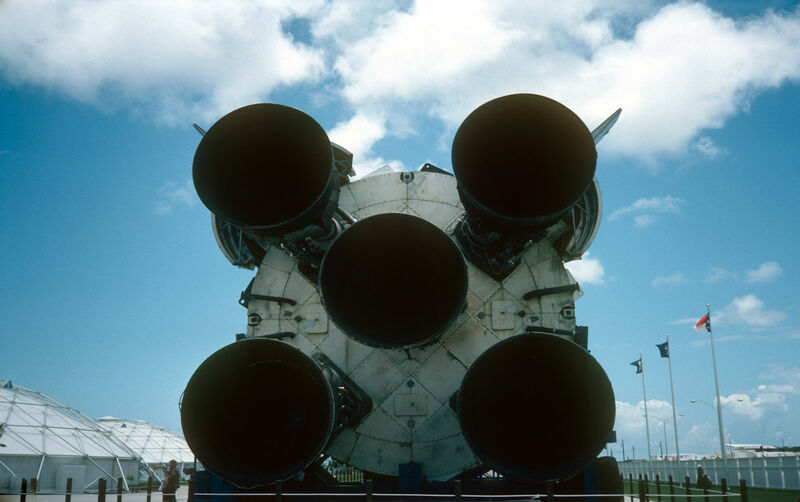 The numbers referred to the plane’s top speed of 600 miles per hour and 880 feet per second. The plane’s first flight was on January 27, 1959. 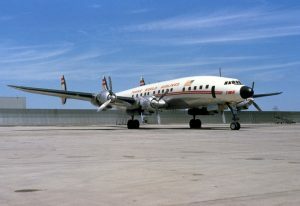 The FAA mandated additional instrumentation for the plane for which Convair added the hump along the top of the fuselage. 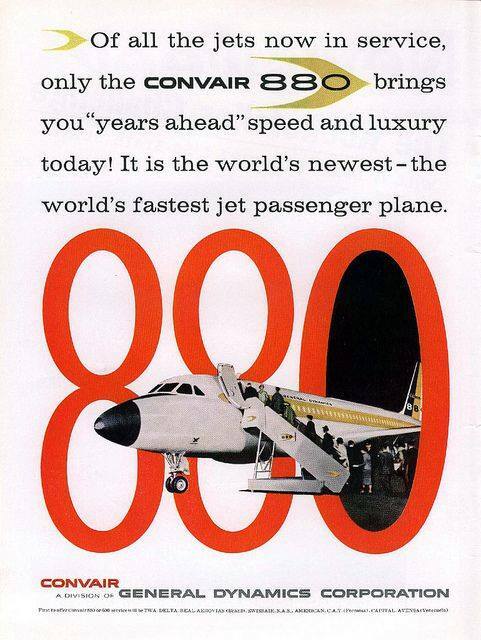 Convair 880 sales were not successful and production ended just three years later. The Convair 880 offered five abreast-seating in contrast to the six abreast seating of the 707 and DC8. 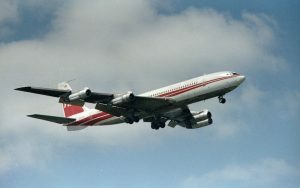 Boeing also outcompeted Convair by offering the 720 medium range version of the 707. 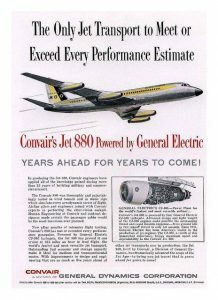 The Convair 880’s General Electric CJ-805-3 turbojets had a higher fuel consumption rate than that of the Boeing 707 Pratt and Whitney JT3Cs. TWA and Delta both placed initial orders for the first forty Convair 880 aircraft. 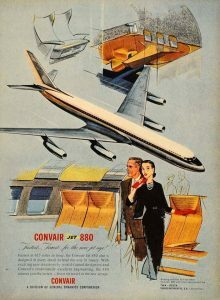 Convair promised the first forty delivery slots to both airlines which likely further discouraged other airlines from ordering the type. Final assembly of the aircraft was at the Convair plant in San Diego California. 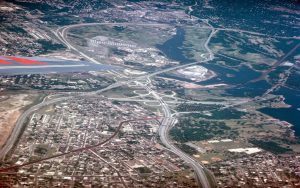 General Dynamics lost approximately $185 million dollars over the short lifetime of the Convair 880 and 990 programs. At that time the losses were the greatest incurred by any corporation. 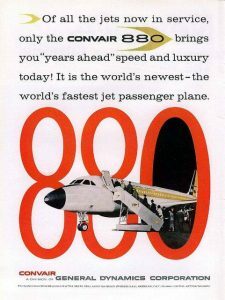 Only sixty five Convair 880’s were produced. During the time of Convair 880 production Boeing built and sold three hundred sixteen 720 and 707 airliners. Howard Hughes was the majority stockholder of TWA at the time and he played a major role in the Convair 880 program. 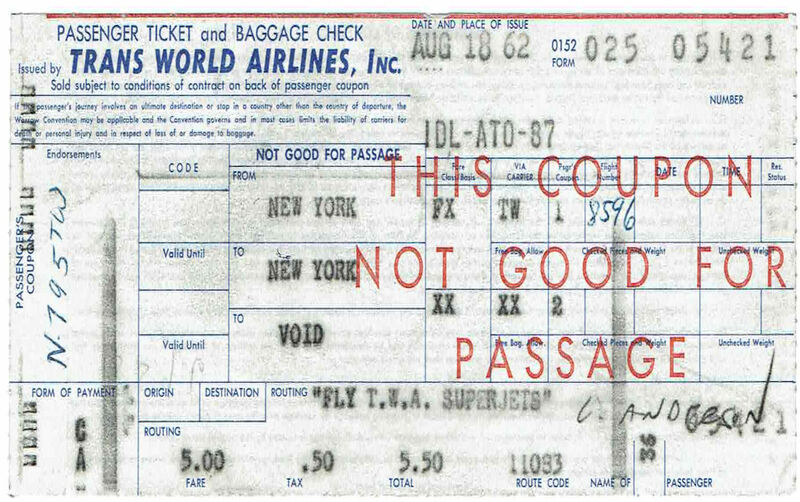 Hughes wanted TWA to have a faster jet than any other airline. 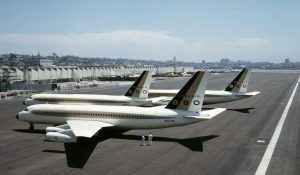 TWA initially ordered sixty two of the 880’s and purchased thirty of them. 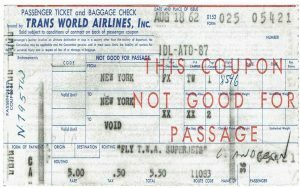 The purchase agreement was not beneficial for TWA in that Hughes purchased the aircraft through his Tool Company and leased them back to the airline for an inflated price. 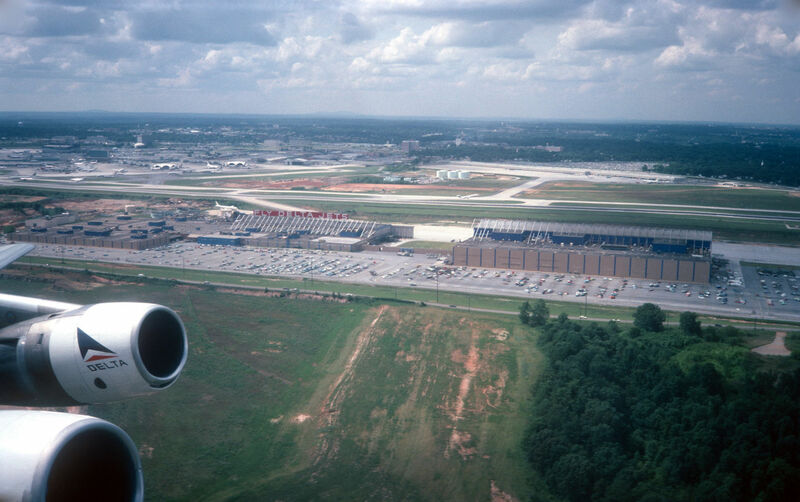 Minority shareholders of TWA sued and Hughes ended up losing control of TWA because outside creditors did not want Hughes controlling both development and operation of the aircraft. 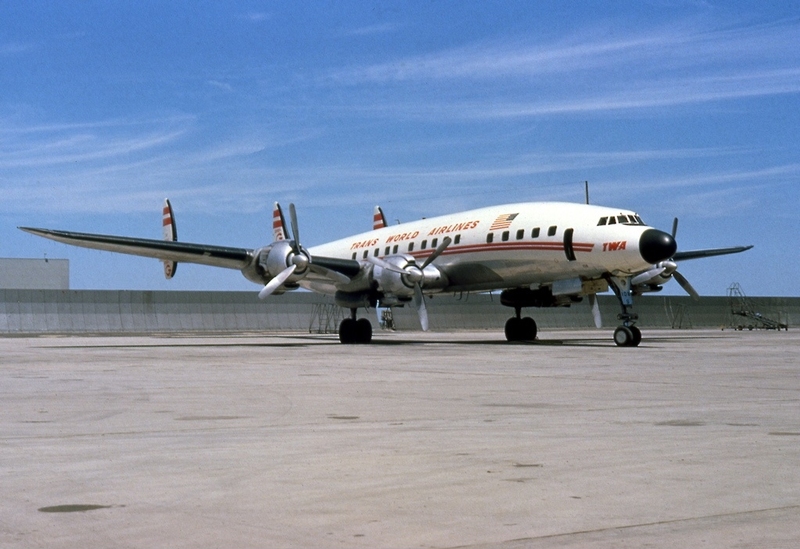 TWA operated Convair 880s from 1961 to 1974. Convair initially used ship one N801TW for test flights. The plane entered service with TWA in 1964 and flew until 1973 when it was stored at Kansas City. 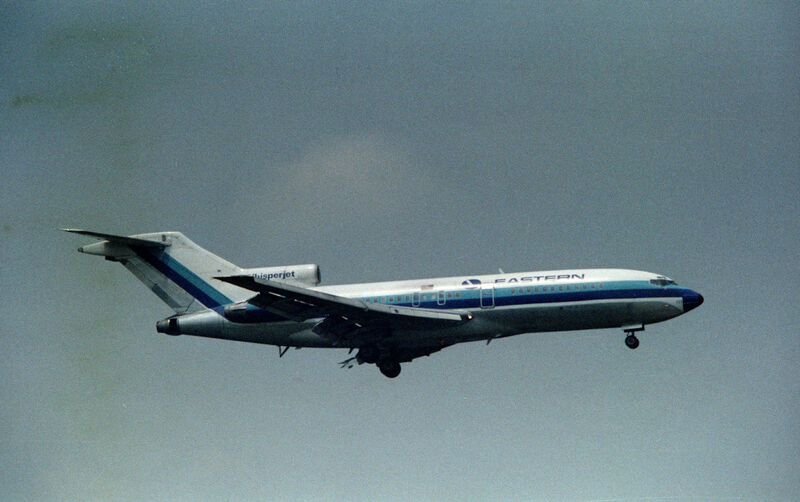 In 1978 the plane was sold to American Jet Industries and ferried to Harlington Texas. It was then ferried to Mojave California in 1980. In 1990 the cockpit was refurbished and painted in Delta colors by Delta Technical Operations employees. A portion of the fuselage was shipped to Minneapolis MN for a film about the Sioux City DC-10 crash. 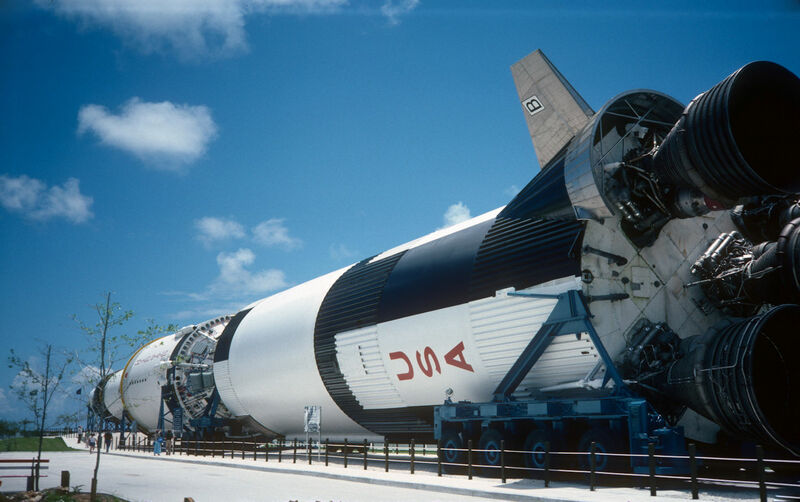 The remainder of the aircraft was scrapped. 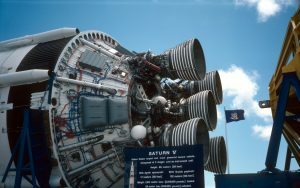 The cockpit was put on display at the Heritage Row Museum at Underground Atlanta. Heritage Row closed in 1997 and the cockpit remained on display at the Atlanta Convention and Visitors Center. It was moved to the Delta Museum in 2015. 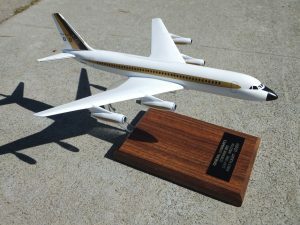 My Convair house colors 880 is the second 880 model that I have built. This kit is by Microscale. Per Jim Striplin and Jim Lund the molds were originally by Allyn and later Topping. Microscale released their kit in 1975. The kit is very simple having approximately six parts in addition to a two part stand. 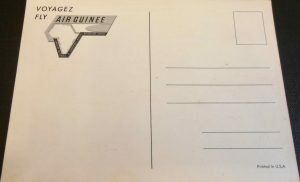 The kit included decals for Delta, Civil Air Transport, and TWA. 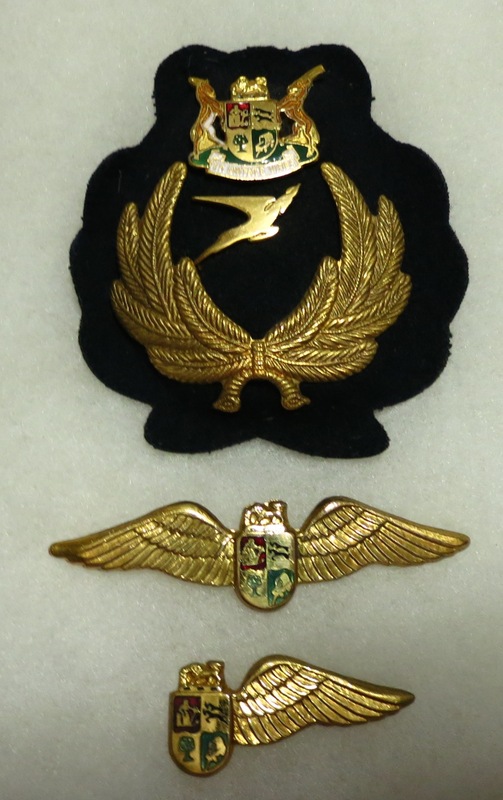 Jim Lund gave me his well-worn kit in Civil Air Transport markings. I stripped the decals off, sanded down a considerable amount of paint, re-scribed the control surfaces and primed the model. Around the same time Vintage Flyer decals released new decal sets which included the Convair house colors so I decided to give them a try. I painted the model gloss white and the nose gloss black. I painted the engine intakes Tamiya gloss aluminum. Since the kit was a “hand me down” I didn’t have a stand so I made one from a wooden trophy base and acrylic rod. I bent the acrylic rod to shape in almost boiling hot water. The original model may have had exhaust noise suppressors which I faked using styrene rod painted dark metallic. I also had a plaque made at a trophy shop for the base which adds a nice touch. 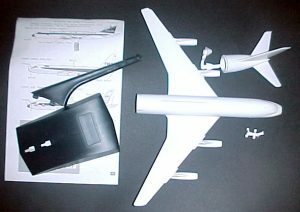 My only complaint about the kit as well as the Hawk/Glencoe release is that the horizontal stabilizers are missing the counter balances. One could add them but I chose to leave my model as is. I’d known about the Microscale kits but was never willing or interested in paying collectors prices for one. Having a donated kit the unique Convair house colors decals available sealed the deal for me to build one. The markings, kit, stand, and plaque all turned out to make a very nice model of Convair 880 ship one. The crew are unquestionably a critical component for a safe and pleasurable flight. This starts up front with the cockpit crew. 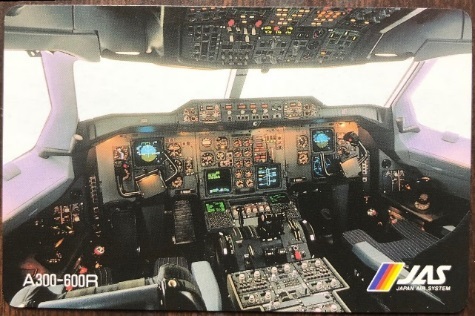 A few airlines have issued playing cards with a cockpit view. Japan Air System (JAS) is shown below. Swedish carrier, Novair, and more recently, China Airlines, have issued a cockpit view with the crew. 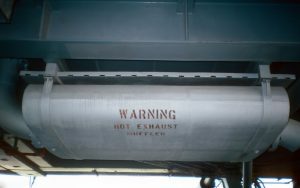 Before 9/11 it was possible to sit in the cockpit jump seat as a passenger if you had the right connections. 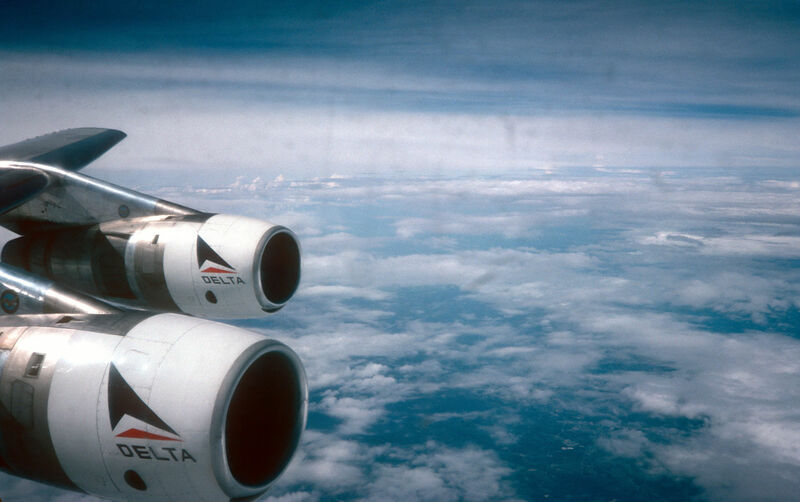 In late 1999 I was invited up to sit in the jump seat on a British Airways flight flying in to London from Chicago. 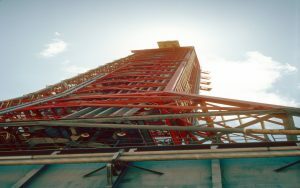 What a view, and at the time – the London skyline was dominated by the huge Millennium Dome Ferris Wheel built for the Millennium celebrations. However, it’s the flight attendants that are front and center with the passengers. 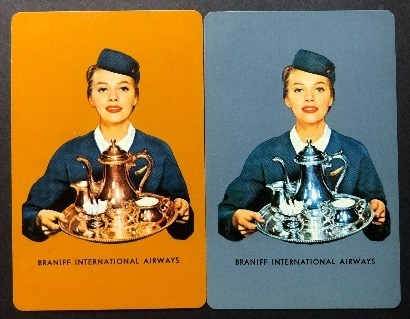 Many airlines have highlighted flight attendants on their playing cards. Braniff Airways, the long defunct US carrier, issued a wonderful pair of playing cards in the late 1940’s showing a flight attendant with a silver tray and silver tea-service. One deck is brown and the other one blue. 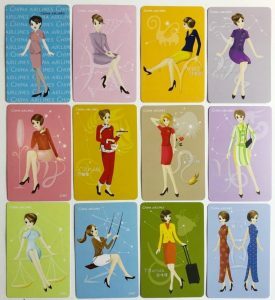 These were the first decks featuring flight attendants that I’m aware of. One of the China Airlines annual set of 12 designs featuring flight attendants was issued in 2008. This is a sought-after series of playing cards. Single decks can be found from time to time on eBay and elsewhere. Singapore Airlines has featured close-up shots of “Singapore Girls” and shots of flight attendants in various scenic and not so scenic locations. 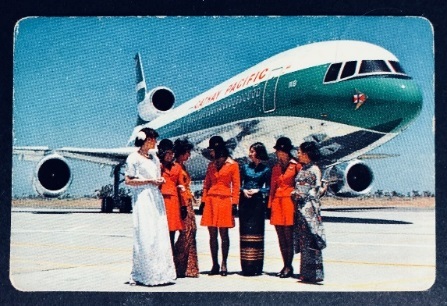 Many other airlines have featured flight attendants include this older design from Cathay Pacific Airways showing the crew standing alongside a Lockheed 1011. 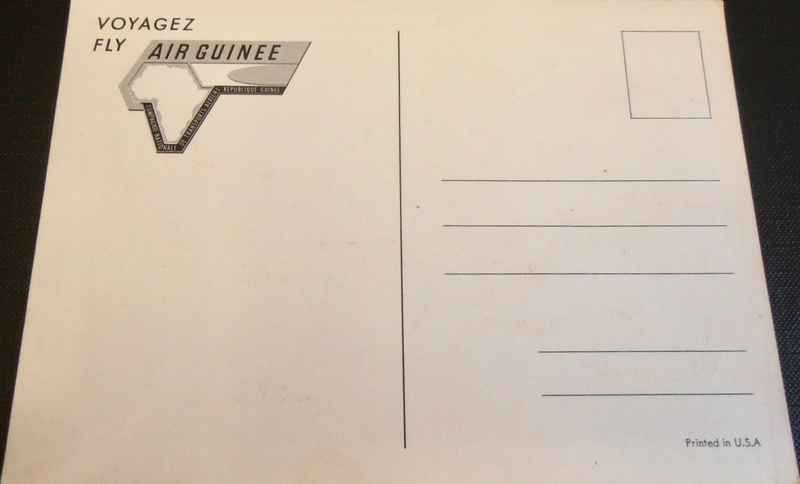 Interior views of the passenger compartment are hard to find on playing cards. 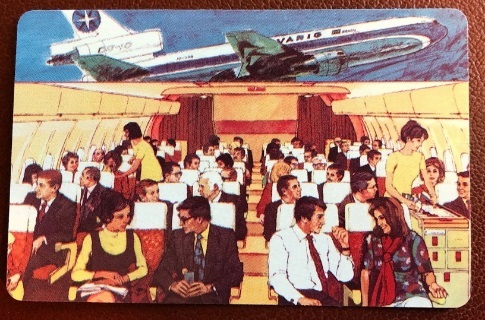 Brazilian carrier, Varig, issued this design of the interior view of its DC-10. 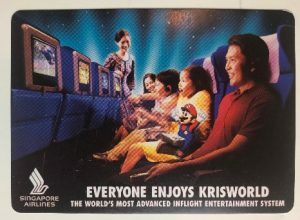 In 2003 Singapore Airlines started to promote their Krisworld entertainment service. What better way than introduce playing cards to help with the promotion? Ironically, electronic entertainment has become so dominant and this has reduced the demand for playing cards. But airlines should understand that electronic entertainment is “for the moment” and playing cards can provide advertising repeatedly over many years each time the cards are played with.